Royal Enfield runs on petroleum diesel or biodiesel fuel. Few Royal Enfields attract more cult interest than the rare diesel powered Taurus models. In even more demand recently are those that will run on biodiesel fuel. 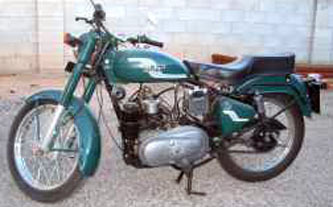 There is a clean looking Royal Enfield powered by a Greaves diesel motor for sale on CraigsList in Albuquerque, N.M. The seller, Ray, says that he runs it on B100 (pure biodiesel fuel). Diesel motor looks natural in Royal Enfield. "I found this bike at a biodiesel conference in Golden, Col., and I envisioned making it my clean, green, commuting machine. I've never owned a motorcycle before, and it wasn't until after I made the purchase... that I discovered that this bike needs some work to run at its best... I'm moving, I'm old, and I don't need another project. "It has the Taurus Greaves engine, and I'm confident that once the rings are removed, they can be matched by any competent machine shop. "I'm not trying to cheat anyone and that's why you can make me a reasonable offer and come away with a super-cool retro bike like no other." 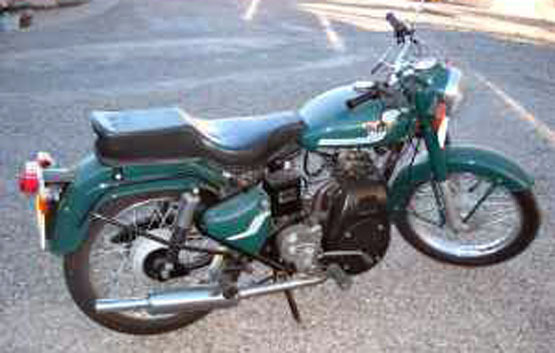 Ray says that he paid $3,940 for the motorcycle in 2006. He prefers to be contacted through his CraigsList ad.